Your family and guests can really spread out in this super-size cottage home. Sloped gables and graceful arches combine with cedar shake, lap siding and stonework to create an elegant Old World exterior with a cottage ambiance. This hillside walkout features an open floorplan and plenty of outdoor living areas. Create tempting meals in the kitchen with breakfast room. Eat outside in the inviting screen porch with skylights. Cathedral ceilings top the great room, master bedroom and screened porch, and three fireplaces, built-in cabinetry and an art niche add custom touches, along with the wet bar and large utility. The master suite offers a sitting area and convenient linen closets. Downstairs, each bedroom has its own walk-in closet and bath, while a powder room services the rec room. 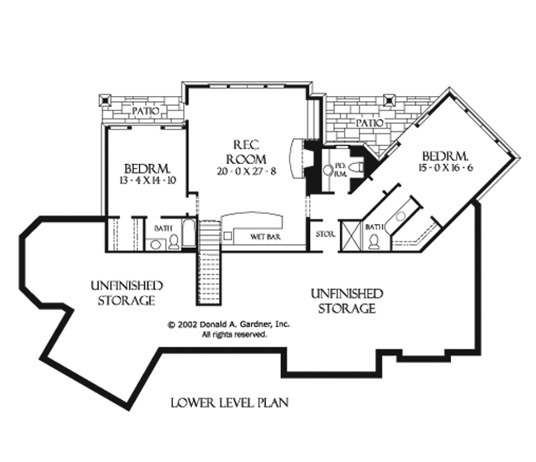 For versatility, the home features a bedroom/study and expandable bonus room. Note the service entry for convenience. 1st Floor: 3006 Sq. Ft.
Porch - Screened: 294 Sq. Ft. Unfinished Basement: 1597 Sq. 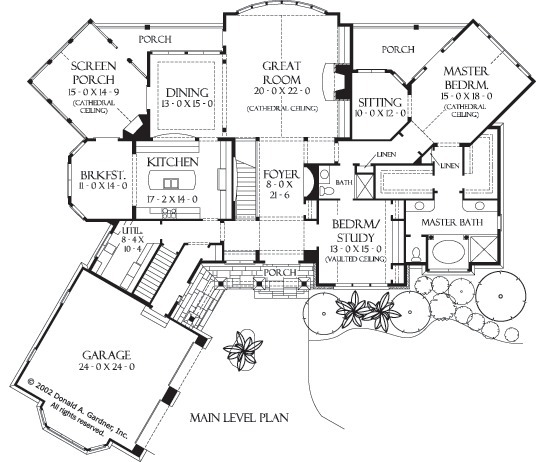 Ft.
House Dimensions: 93' 11" x 80' 9"
Great Room: 20' 0" x 22' 0"
Bedroom #3 : 13' 4" x 14' 10" x 10' 1"
Bedroom #4 : 15' 0" x 16' 6" x 10' 1"
Porch - Front : 20' 4" x 4' 8" x 10' 0"
Porch - Left : 23' 0" x 5' 0" x 0' 0"
Porch - Right : 20' 8" x 8' 4" x 0' 0"
Porch - Screen (Cathedral): 15' 0" x 14' 9" x 17' 2"
Deck / Patio : 14' 2" x 5' 0" x 10' 0"
Deck / Patio #2 : 20' 8" x 8' 4" x 10' 0"
Storage (Other) : 5' 6" x 4' 4" x 10' 1"
Other : 20' 0" x 27' 6" x 10' 1"
Other #2 : 10' 0" x 12' 0" x 10' 0"
Garage : 24' 0" x 23' 10" x 0' 0"
Master Bedroom (Cathedral): 15' 0" x 18' 0" x 17' 2"
Bedroom / Study (Vaulted): 13' 0" x 15' 0" x 13' 6"
Foyer : 8' 0" x 21' 6" x 10' 0"
Dining Room (Tray): 13' 0" x 15' 0" x 11' 0"
Great Room (Cathedral): 20' 0" x 22' 0" x 21' 10"
Kitchen : 17' 2" x 14' 0" x 10' 0"
Breakfast Room (Vaulted): 11' 0" x 14' 0" x 12' 10"
Utility Room : 8' 2" x 10' 6" x 10' 0"
Bonus Room (Vaulted): 15' 5" x 23' 8" x 9' 0"